ABOVE: Taxis in the Piazzale Roma, the automotive gateway to Venice's historic center. Venice taxis come in two varieties: water taxis (which are convenient but expensive) and land taxis, the subject of this article. Land taxis are of limited utility in Venice, because most of the city is off limits to automobiles. The Piazzale Roma is as close as a four-wheeled taxi can get to Venice's historic center. From there, you'll need to reach your hotel, hostel, apartment, etc. on foot or by vaporetto (water bus). You're staying at a hotel on the mainland (e.g., in Mestre or Marghera), where the taxi can deliver you to the door. You're heading directly to the Venice Cruise Terminal from Venice Marco Polo Airport, or you're going to a ship from a hotel in Mestre. You're staying at a hotel near the Piazzale Roma and prefer a private taxi to the cheaper and equally convenient airport bus. 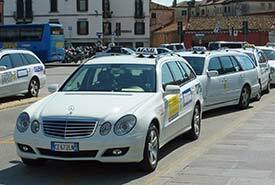 At Venice Marco Polo Airport, follow the taxi signs on the arrivals level. At the Piazzale Roma, look for a taxi rank along the tree-lined side of the square. If you're coming from Treviso Airport (which serves Ryanair and several other budget airlines), take the ATVO or Barzi bus, or you may end up spending far more on a taxi than you did on your air fare. ABOVE: A sign in a Venice taxi window from January, 2019. 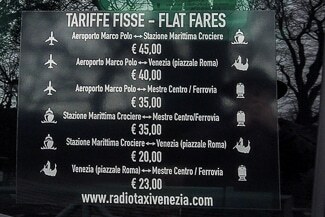 The table shows flat rates between majoe points such as the airport, cruise terminals, Piazzale Roma (central Venice), and the Mestre railroad station. Plan on spending 40 euros for a taxi between Marco Polo Airport and the Piazzale Roma. For other fares, see the photo above. Add-ons for luggage, late-night trips, and travel on public holidays could push the fare higher, so ask the driver for an estimate if you're watching your euros. Final note: If you're arriving at the Venice Santa Lucia Railroad Station, you won't be able to get a land taxi. However, you can turn right as you leave the station and reach the taxi stand in the Piazzale Roma by walking across the new Ponte di Calatrava (officially "Ponte della Costituzione") bridge.